In a hot pan add onions and 1/4 Cup of water. Sweat the Onions until they are a little soft. Then add ginger and garlic then add another 1/4 cup of water until it evaporates. Then add oil and all spices, salt and pepper and toast the spices for 30 seconds then turn off the heat. Set aside. Add Chickpeas, Aquafaba, Quinoa, to FOOD PROCESSOR season with Salt and Pepper plus 1 teaspoon of tandoori masala spice. Pulse until lightly incorporated then add onion, ginger and garlic spice mixture and flour, turn ON food processor and mix until a smooth thick paste. Check seasoning and adjust by adding more salt and pepper if needed. Taking about 1/4 Cup of mixture- form into large patties. Place patties on a hot griddle or cast iron skillet lightly sprayed with a nonstick spray. Pan Sear Chickpea Patties until golden on each side. Place Vegan Sliced Cheese on as soon as you flip patty to ensure cheese melts. 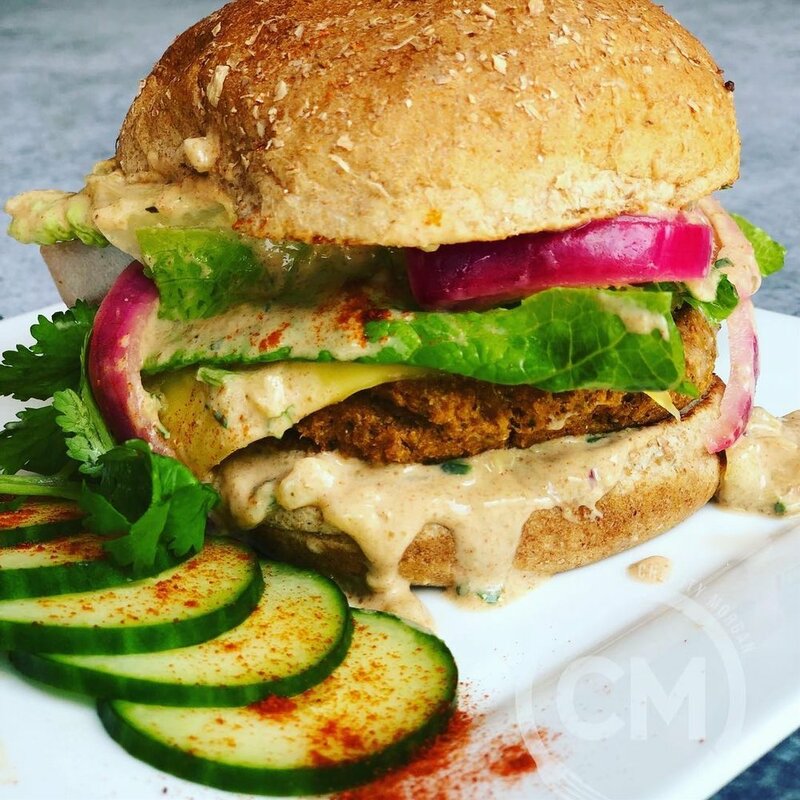 Place chickpea patty on Buns and serve with cucumber raita (recipe below) and desired toppings. *Chef's Tip- If you have extra form patties and place on parchment and store in a ziplock bag or freezer safe conatiner and freeze for a later yummy burger. Grate Cucumber on top of 3 layers of Paper towel or 1 layer of cheesecloth. Secure cucumber shreds and gently squeeze out all excess water out of the cucumber. Place in bowl and add all ingredients mix well. Serve with Burgers Recipe above.